Esther Richards wants more choice as she nears the end of her life. Esther Richards is in a race with political and public sentiment. If she loses the race, it could cost her a few precious weeks of life, and perhaps lead to a very unpleasant end. After two years of remission, Esther has just learned her brain tumors have returned. “I am not afraid of dying, because I believe in God,” she says. “But I am very afraid of the way I will die.” An oncologist told her it won’t be nice, and it won’t be peaceful. That prognosis is adding heat to Esther’s support for the End of Life Choice Bill. “The cancer won’t kill me, and the brain tumors won’t kill me. What it does is shut down my organs one at a time.” She says she will end up bed-ridden, her muscles atrophied, wearing a nappy and fed through tubes. Unfortunately, her first bout of cancer four-and-a-half years ago meant that painkillers that would ordinarily work for anyone else would not work on her. She is in the six per cent of patients for whom the drugs don’t work. One of Esther’s problems is the time frames involved. 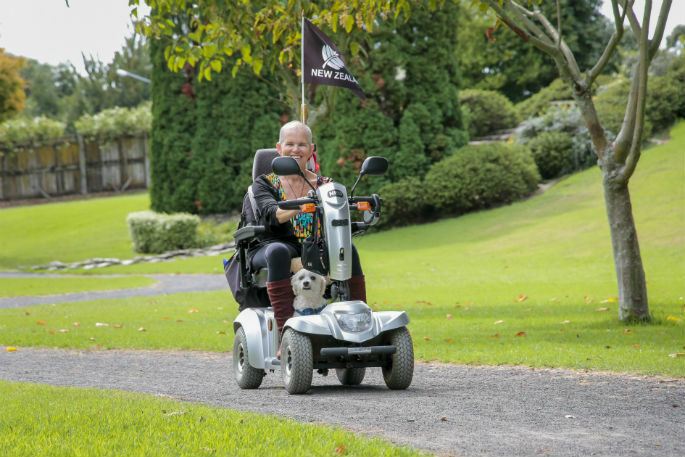 She doesn’t know how long she has, and she is banking on a swift passage into law for ACT leader David Seymour’s End of life Choice Bill. She has long championed the right of the terminally ill to have control over their end. “I need something to focus on while I wait for my death to come,” she says. Esther has a best-case scenario worked out. The Justice Select Committee, which received 35,000 submissions on the bill, reports back to parliament early next month and gets a positive hearing at its second reading, sparking a referendum alongside next year’s general election and a third reading in 2021. “Then, if approved, it would be a year to 18 months before the processes are put in place so doctors can start work,” she explains. Esther ticks all of the boxes and all of the criteria under the proposed legislation. She’s a New Zealand citizen over 18 suffering a terminal illness likely to end her life within six months. More generally, she has a grievous and irremediable medical condition undergoing an advanced state of irreversible decline and she understands the nature of assisted dying and the consequences. With boxes ticked, the doctor has to determine, amongst other things, that the patient isn’t being pressured, and then encourage them to talk it through with family, friends or others. A second doctor will be asked for an opinion and a third if necessary. It’s a complex process for a difficult and complex issue. The criteria is strict to avoid recklessness, disadvantage to the vulnerable or abuse. But in the end, as the preamble to the bill suggests, it allows people who so choose, and are eligible under the bill, to end their lives in peace and with dignity, surrounded by loved ones. Without the End of Life Choice Bill, Esther Richards will make sure she is in a position to control the end of her life. “I will probably die a couple of months before I needed to,” she says. “If the legislation was in place, I would leave it to the last couple of weeks.” And it will be as peaceful as she can make it. Esther - we so support your struggle and your positivity amazes everyone. Esther - we stand beside you.